Here’s hoping we all see many robins this year, regardless as to what species of robin it is! And let’s also hope that they keep making more robins so there will always be some to see! This post has been submitted to Bird Photography Weekly #30. Go check it out! My state bird and a personal favorite! 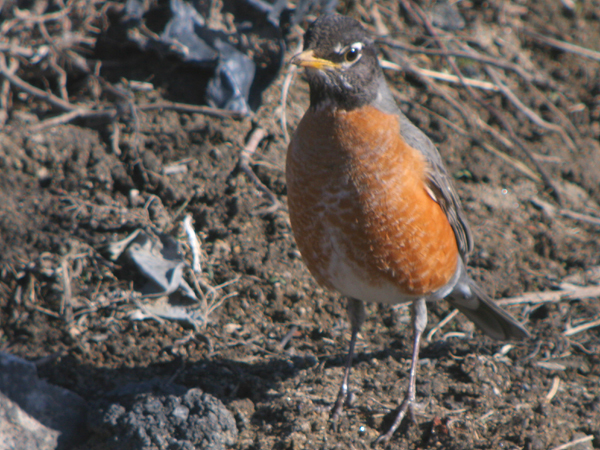 I did see several wintering robins this year but the first one I see in the yard in spring is always a thrill. I saw a lot of Robins this winter here in Oklahoma. They come in flocks (10-20)and land on our property. Do they travel in flocks? Hey Corey, great captures of this iconic bird. I love watching the robins and hearing their sweet songs in the springtime here. The fourth shot of the bird standing on the rock is exceptional. I’m looking forward to seeing many more in the coming months. @WisconsinBirder: It’s great to see them foraging in the yard, isn’t it? @Tamatha Smith: They sure do travel in foraging flocks in the winter, settling down to feed for the day when they find something good to eat and roosting near each other at night. @Larry Jordan: Thanks! I was pretty pleased with that shot myself. The robins are back for spring! I was birding at Kissena Park and there was a large flock of robins on the lawns. The same thing today. for the second year in a row a robin has started flying towards my deck glass doors and attacing the window with her beak. goes on all day……what is this about? Hi Julie – are you sure it’s female bird, because my guess would be that at this time of year the sun is shining straight onto your windows and the Robin is seeing its reflection and in a bit of a ‘rising sap’ hormonal state is also ‘seeing’ a rival and is repeatedly trying to drive it away. Can anyone explain the strange springtime behaviour of a robin which flies continually into my front window and back to a tree just in front of the window? It has happened for the past couple of years without fail, and I simply don’t understand it! It starts early in the morning, and until I realize what it is, it sounds as if someone is incessantly tapping on my front window! Any help would be appreciated. Thanks! @Lewis: Odds are that the bird is seeing its reflection and thinking it is a rival bird. If you put up a couple decals on the window (or otherwise reduce the reflectivity) it might break up the reflection enough that the robin will be convinced that it has driven his rival away. I’ve been informed by a “Medium” that a robin pecking at your window suggests that the bird is a “Angel Friend Guide” and wants you to consider what your thoughts or actions are when it strikes the window. I was informed that the bird knows what you are thinking. I hope he/she didn’t charge you for that piece of advice Dave? I guess your medium isn’t much of a birder because Corey gave the answer a few comments above, and that’s the right one…What makes me so certain – because birds all over the world have been doing the same thing to reflections in water, mirrors, windows, metal doors etc etc for many, many years. Sorry to be a mythbuster. WHAT SHOULD YOU DO WHEN A BABY BIRD AND NEST HAS BEEN KNOCKED OUT OF A TREE? @Deborah: DON’T YELL AT IT IN ALL CAPS! But, seriously, try to put the nest back, and, failing that, contact a wildlife rehabilitator. I just saw robins on my neighbors gutters yesterday. They were looking down at the four feet of snow and thinking what the hell. I was needing to know what i could do to stop the robin from pecking on my windows. Please if anyone knows anything that i could do please let me know. I had a robin flying into my window repeatedly causing quite a mess on the window. Poor thing. I put up a black felt drawing of a face on white paper and it moved on!!! @Kaleb: Some birds attack their own reflection becasue they think they are attacking a rival. Try putting temporary stickers on the window, or anything else that will break up the reflection. In a day or two the bird should get it and quit. 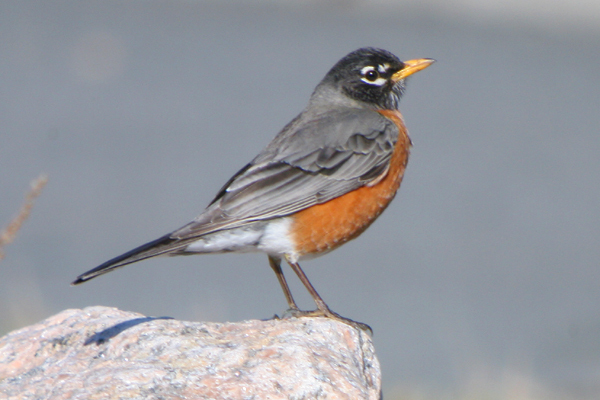 When I was a boy growing up in Iowa some sixty years ago, we would “stamp” the first robins in spring. You licked your thumb, press it into the palm of your other hand followed by a “stamp” with the bottom of your fist. You could “stamp” as many robins as you wanted and once “stamped”, that was your robin and no subsequent “stamps” were binding. I am mostly sane and not nearly creative enough to think this up, but nobody has heard of this. Can anyone help? Fred…where in Iowa did you grow up? I think we must be about the same age. I’m from Waverly, Iowa. I grew up in NW Iowa, and my father and I stamp robins all the time!! I live in Chicago now, people think I’m crazy here! I grew up in Boone Iowa. My dad taught me the tradition of stamping robins. My daughter and her husband are now stampers too and so will my granddaughter Lucy! Fun little tradition. We “stamped” the first Robbin we saw in spring. My mom taught me. I think it was to bring good luck. I live in southern Wisconsin. And that’s 60 odd years ago, too. Maybe it’s regional. Wherever I was I stamped and then called mom. It was a race to see who stamped first. My grandmother also stamped. “Stamping” the first robin of Spring is a Pennsylvania Dutch custom that is supposed to bring good luck for the year! My sister and I grew up in Napanee Ontario Canada (200 miles east of Toronto) and we “stamped” robins when we were kids…. in fact we still do! I’d never heard of anyone else doing it and I have no idea where we learned it. I grew up in Kalamazoo, Michigan. My mother, born in 1924, taught my sister and me to stamp robins when we were kids in the 50’s and 60’s. What a joyous memory particularly after a winter like this! Kalamazoo had early families from the Netherlands…not sure if the custom was popular there. 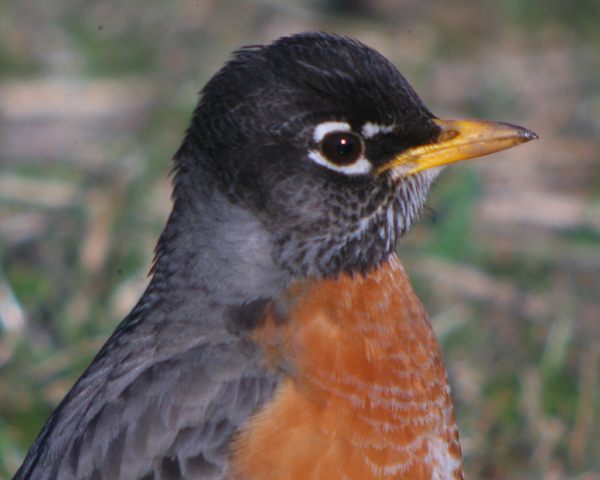 The last two years, starting the end of March, every day a flock of 15-30 Robins gather in the yard, and all of them heading the same direction, run about 3 feet, stop, run 3 feet again, and continue to do that repeatedly. What are they doing? @Connie: They are looking (and listening?) for worms beneath the surface. I have been “stamping” the first Robin I see each Spring since I was a kid. My mom always said it was lucky to do so – needing all the luck I can possibly get I continue the ritual. Being raised in Eastern Nebraska I assumed the ritual was a midwestern thing. I have shown this to a number of my friends in hopes that they pass it on. I think it is sweet. Oh yeah, I grew up stamping the first robin – just as you explained Fred Jacob, licking the thumb and pressing to palm of other hand etc. And I grew up in Nebraska and did this as a youngster. Happy spring to everybody. Fred Jacob, when I was a little girl my mom would stamp the Robins. She past away when I was 8. Everytime I see a Robin I think of her. I googled for an hour looking for anything on this. Thank you for posting. I also grew up in Iowa. thanks to all for shedding light on the tradition of stamping robins—my mother who died several yrs ago at the age of 89 always stamped robins, but none of us ever knew the reason—-she is looking down on all of us robin stampers—keep stamping! So fun to hear everyone’s comments on stamping robins. I, too, grew up with the tradition in NE Iowa… passed on by my dad. We never knew, exactly, why we did it.. just “because Dad did”, I guess. I love remembering him this way and I’m so happy others grew up with the same tradition! thank you so much for posting about “stamping” robins. My grandmother ALWAYS stamped robins and as she grew older w/ diabetes she couldn’t see that well but she could always see the robins!! I still do it and my bf thought I was crazy for doing so!!! Now I know I’m not!! oh and I’m from NE Indiana!! Southern Ontario, too. My dad stamped the first robin each spring, and I have been doing it wrong until I read about the lick-palm- stamp technique. I can see him doing it, gone though he is six years. If you don’t have snow, you don’t get it. 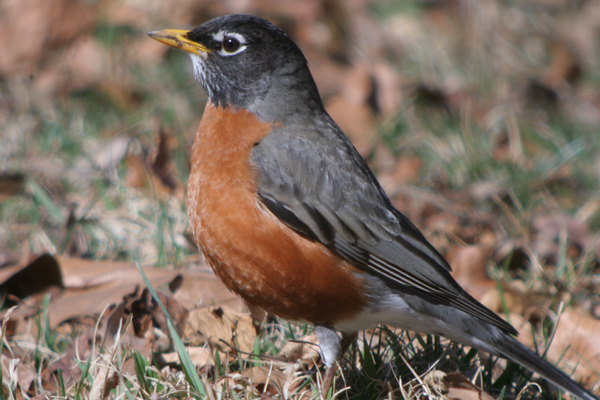 I just saw my first two robins of the spring on my front lawn and promptly stamped them just as I did as a kid, and taught my kids and grandkids to do. I’m from southeast Iowa. I’d been told by my mother that as soon as you’ve stamped 100 robins, you can make a wish and it will come true. I was curious about this custom but nothing came up on a search until I found this website, so thank you to everyone for sharing and letting me know I wasn’t stamping alone! Reporting in from Northern Illinois here — the tradition (passed down from my grandmother) lives on here, too! Get to 100, and you can make a wish!